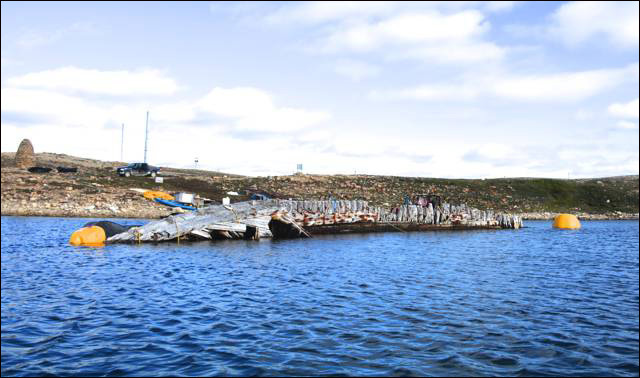 Due to the strategic location of this transportation hub in the Central Arctic, Cambridge Bay has been described as the make or break point for anyone attempting a transit of the Northwest Passage. For those coming like us from the west and chasing the retreating ice, this is the place to pass a nail-biting time waiting and hoping that the ice will break up in the Eastern Arctic allowing us to reach our goal: the Atlantic Ocean. The critical part of this final section of the Northwest Passage is only about 500 miles long, but usually it is also the most difficult to negotiate. For those heading west, as we attempted to do last year, getting to Cambridge Bay is a great achievement, but it is still only a first and relatively short step towards completing a transit of the Northwest Passage during the quickly shrinking favourable season. Often the only alternative for boats heading either way is to spend the winter here, and continue their voyage the following summer. 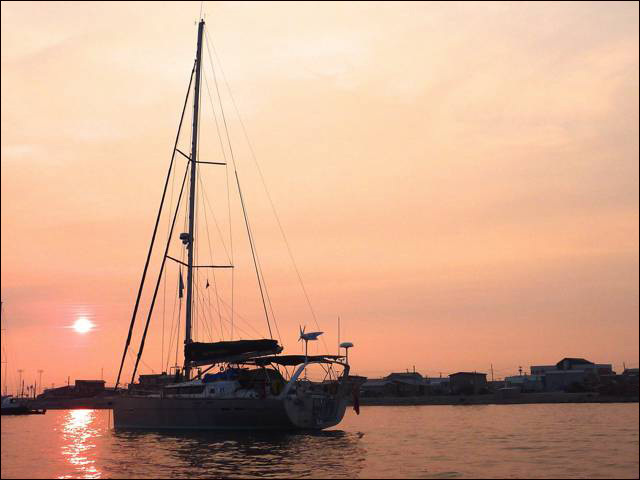 At the moment there are three yachts here, and all had spent the winter in Cambridge Bay, two of them, both Canadian, hoping to set off westwards soon: Gjoa and Wave. They were both hauled out by a shore crane last September and now cannot get back in the water as there is no crane driver or anyone who knows how to operate a crane in Cam Bay. They had been waiting for three weeks and were expecting a crane driver to fly in from somewhere south today to end their ordeal. The Australian Philos is heading east, the same way as us. 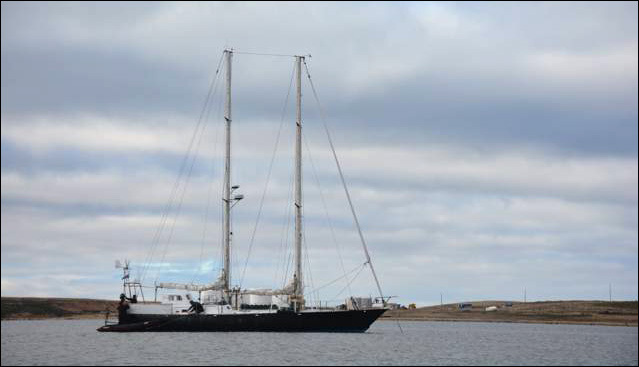 Philos is the former French yacht Damien II, well known in France for its long history of Antarctic expeditions. 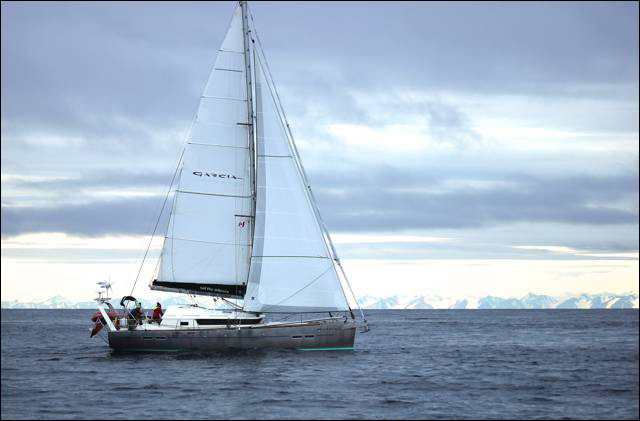 The current owner Roger Wallis purchased Damien II with the intention of transiting the Northeast Passage, north of Siberia. After lots of efforts he finally managed to obtain permission from the Russian authorities for his planned voyage. The permit was eventually granted last year, only to be withdrawn for political reasons shortly before the planned departure. 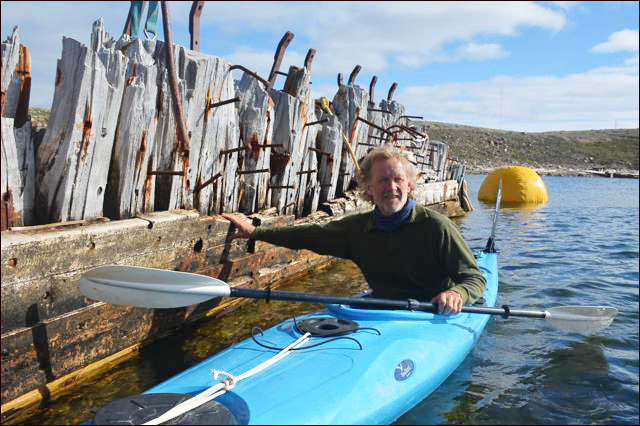 So, Roger turned around and headed instead for the Northwest Passage instead, but with the season far too advanced, he also had to spend the winter in Cambridge Bay. 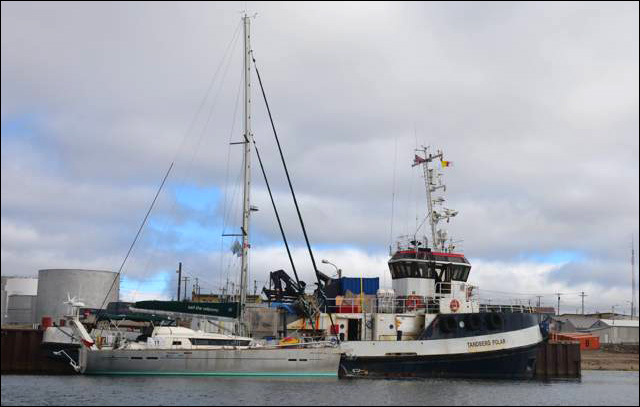 There is one more vessel that had spent the winter here: the Norwegian tug Tandberg Polar. 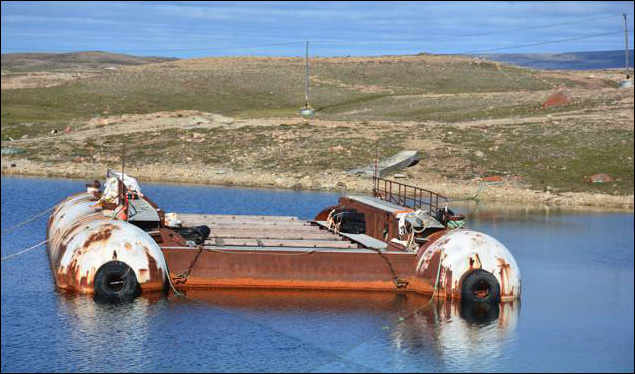 I had met its crew last year in Aasiaat, Greenland, where my attention was drawn by a huge barge that the tug had towed all the way from Norway, bound for Cambridge Bay. After his successful transit of the Northwest Passage in 1903-1906, and the even more audacious voyage to the South Pole in 1911, this most famous of all polar explorers decided to build a special ship that would become deliberately captive in the polar ice cap and drift from the Bering Sea across to the North Pole. His mentor and predecessor Fritjof Nansen had attempted to do the same on the vessel Fram and had come within a few hundred miles of the North Pole, so a new attempt seemed to be justified. The 120 ft long Maud, named after the Queen of Norway, was possibly the strongest wooden vessel ever built. She survived three seasons in the iron grip of the polar ice pack, but she never managed to drift all the way to the North Pole. 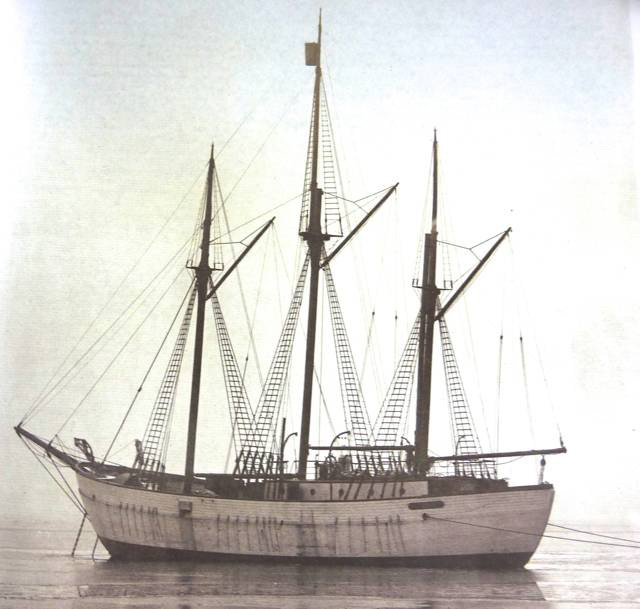 Amundsen abandoned the project, Maud was sold to the Hudson Bay Company, and she came to a sad end, a pitiful wreck in this remote Arctic harbor. With the centenary of Maud’s maiden voyage due in 2017, Jan Wanggaard, artist, writer, adventurer and former windsurfing world champion, decided that it was high time for Maud to return home. In 2011 he formed a small team of friends, each with the essential skills for the job, and set in motion a project to raise the Maud and transport her back to Vollen, near Oslo, where she had been built. 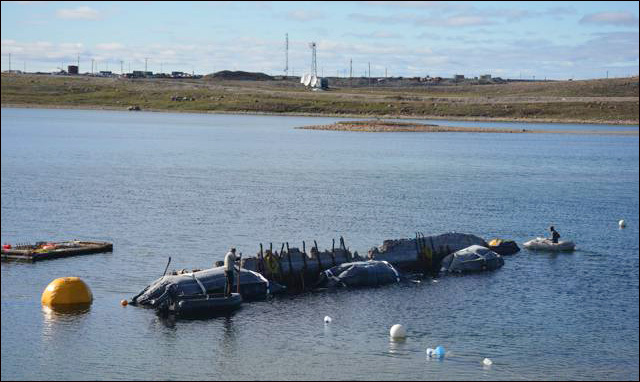 Fours years of efforts and preparations should soon bear fruit as Maud is already attached to a set of floating devices, both underwater and on the surface, and the raising operation is scheduled for later this month, just in time before the onset of a new Arctic winter. 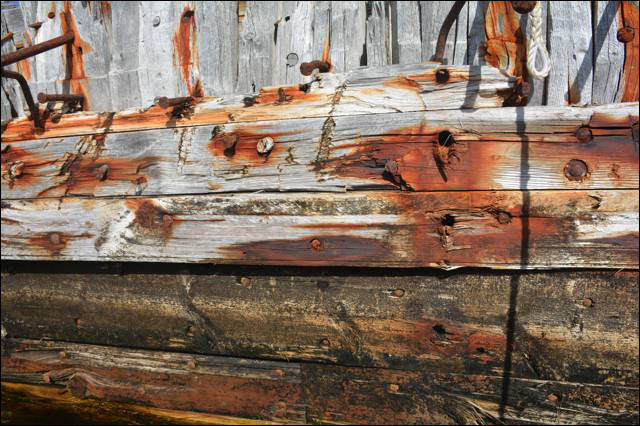 In spite of having spent 85 years ravaged by winter storms and frozen in ice for nine months of the year, the Maud is still in surprisingly good condition, her 12 inch thick oak beams and 3 inch oak sheathing looking in remarkably good condition.